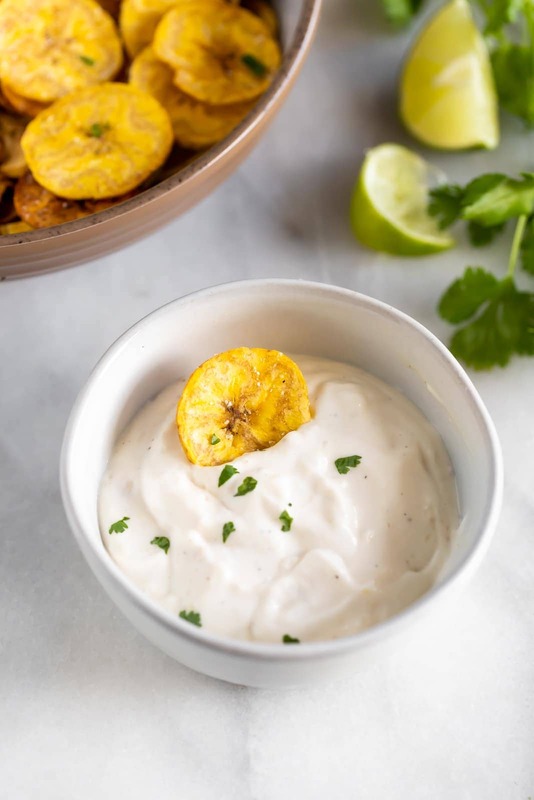 Crispy, salty, baked plantain chips with a vegan garlic dip. The perfect paleo, dairy-free, vegan snack made with just 5-ingredients! Anyways, to keep this tradition alive in a much healthier manner, I made these baked plantain chips in the oven instead of frying them. They were super easy to make and were as crispy as if you were frying them. To sweeten the deal, I made this vegan garlic dip using Califia’s Unsweetened Almondmilk for an even more enjoyable treat! Here’s what I did. First, you MUST buy a plantain that is very green. If the plantain is yellow or dark, that means it’s ripe and you won’t get the same result. Green plantains give us a crunchy plantain chip which is what we’re looking for here. 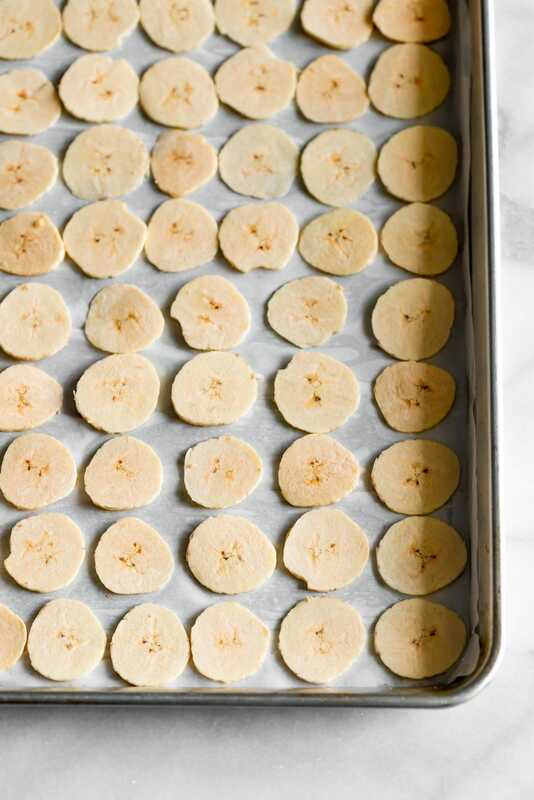 Thinly slice the plantain and place the slices on a baking sheet. Spray with coconut oil or avocado oil and season with salt. Bake for 20 minutes or until they are crispy. Ta-da! That’s it! 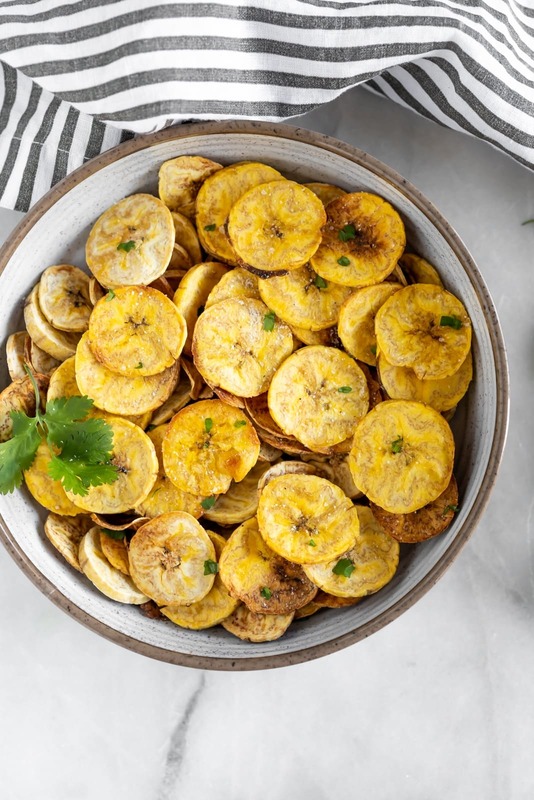 You can enjoy these plantain chips as a snack or even a side dish. To make this vegan garlic dip, all you do is add vegan mayo, garlic cloves, almond milk, lime juice, and pepper into a food processor. Blend it up and taste test. If it needs salt, feel free to add. Califia’s Unsweetened Almondmilk makes this dip so creamy. It is soy-free, dairy-free, gluten-free, carrageenan-free, non-GMO, kosher, vegan, and BPA-free. There’s no sugar so no need to worry about it altering the taste of this vegan garlic dip. That’s all folks. This is such a delicious easy snack for any occasion! The garlic dip tastes super garlicky and the consistency is similar to store-bought onion dip. IT’S SO GOOD! Can’t wait for you guys to make it! Interested in snagging up some Califia Unsweetened Almond Milk for yourself? Click here to shop and use code SASSYSPOONxCALIFIA for 15% off + free shipping on your order! 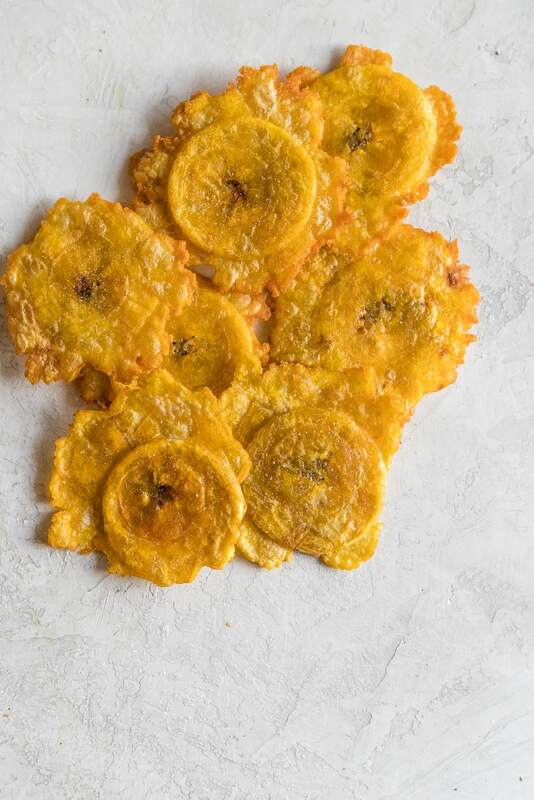 Place thinly sliced green plantains on baking sheet. Spray with coconut oil or avocado oil. Season with salt. Bake for 20 minutes until golden and crispy. To make the vegan garlic dip, add together mayo, garlic, almond milk, lime juice, and salt + pepper to a food processor. Pulse until combined. Taste and adjust with salt or pepper. Serve baked plantain chips with vegan garlic dip. Enjoy!